Supply lasts a 4 lb. (1.8 kg) kitten for 11 weeks. Suggested Use: Our recipes list the amount of supplement required for that recipe. You may increase or decrease the amount of food you prepare by proportionally increasing or decreasing all ingredients in the recipe. Your kitten’s weight determines how much he or she eats, and our recipes have the correct proportions to meet the nutritional requirements for a kitten of any weight. It is best to mix the supplement into prepared warm food, but the supplement can also be added during the cooking process. Feed your kitten freshly prepared food for superior health! Kittens (up to 8-12 months old) and lactating cats need Vegekit™ for growth and lactation. For convenience, adult cats may be fed with Vegekit™ in households with both kittens and adult cats. While cats are carnivores, their nutritional needs can be met by a properly supplemented plant-based diet. 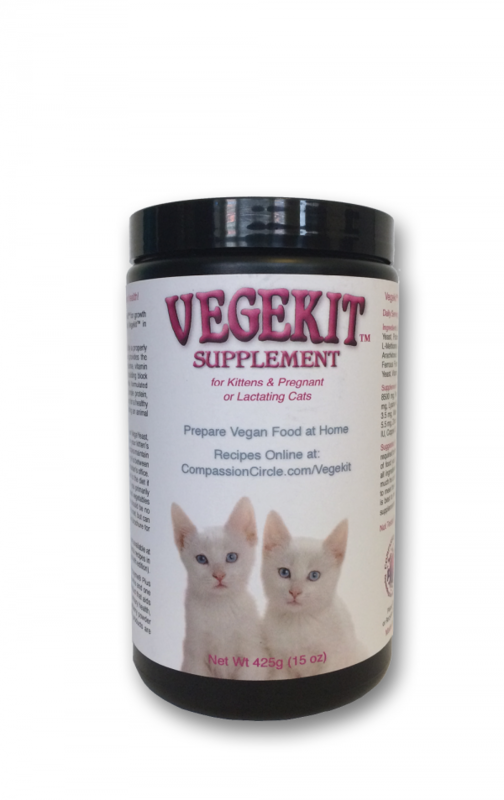 The Vegekit™ supplement provides the nutrients cats require from non-animal sources, including: taurine, vitamin D2, vitamin A, the essential fatty acid arachidonate, and a building block of L-carnitine (methionine). Vegekit™ recipes are carefully formulated to provide lysine (the other building block of L-carnitine), ample protein, essential fatty acids in the correct ratio, and all else necessary for a healthy cat. We do not recommend adjusting recipes without consulting an animal nutritionist. All recipes include food yeast. We highly recommend using our VegeYeast, a brewer’s yeast that is more acid than other food yeast. The ideal urine pH is between 6.0 and 6.5, and urine pH can be tested at home or at a veterinarian’s office. Cranberry powder or vitamin C (ascorbic acid) can be added to the diet if additional acidity is needed. Please consult your vet for the appropriate amount of vitamin C to add to the diet. Wet food is best for urinary health of your kitten. If you primarily feed dry kibble, it is best to add moisture to the diet. Pureed vegetables add moisture and additional vitamins and minerals. Veggies should be no more than 10% of the diet to ensure the protein requirement is met, but can be added to wet or dry food. Please see the recipe instruction brochure for more information. Recipe brochures accompany the Vegekit™ supplement and are available at www.CompassionCircle.com/Vegekit. You can also find wonderful recipes in Dr. Pitcairn’s Complete Guide to Natural Health for Dogs & Cats (4th edition). Suggested Adjuncts: For optimal health, add lactose-free Prozyme® Plus to every meal. A 10.5 ounce bottle will last one cat for 32 months and one kitten even longer. The digestive enzyme amalyse is particularly important for cats or kittens on a plant-based diet. For urinary health, add Cranimals® Urinary Tract Supplement – an organic cranberry powder that increases urine acidity and provides antioxidants. Both products are available through Compassion Circle.